Editor’s Note: News of a new Norterra school was first published by North Phoenix News last week. The story below is a more in-depth look at the decision, from the Jan. 17 issue of In&Out Magazine, our sister publication. Deer Valley Unified School District School Board voted 3-2 last week to approve a land-swap agreement allowing the district to construct a K-8 school on a parcel that’s been set aside within USAA’s Union Park residential development, under construction near 19th Avenue and Happy Valley Road. The decision, at the board’s Jan. 8 meeting, was fueled by ongoing residential growth in the Norterra area, as well as the district’s desire to be competitive in serving as many students as possible in North Phoenix. It came after months of negotiations with USAA and just three days before a deadline that would have freed USAA to negotiate with charter or private schools for the plot. In exchange for the 12-acre Union Park site, DVUSD will give USAA 14 acres it owns and had no intentions of developing in the near future, at 43rd Avenue and Alameda Road, about four miles away. The agreement “allows us [the district] to divest ourselves of some land we’re really not going to develop… [and] allows us to address student growth in an area where we don’t have a great plan to accommodate those students,” Jim Migliorino, deputy superintendent of fiscal and business services, told the board. DVUSD has bond-fund authorization from a 2013 election for the construction of a new elementary school, and the agreement with USAA now obligates the district to use those funds for the new Union Park school. No other elementary schools are planned in this area to accommodate a projected influx of 1,125 students from Union Park and other developments between Happy Valley and Dove Valley roads (part of the North Gateway Village planning district of Maricopa County) over the next five years. Three board members, Ann Ordway, Ann O’Brien, and Julie Read agreed the school is necessary to accommodate rapid student growth in the area and to alleviate overcrowding at nearby Norterra Canyon and Sonoran Foothills schools, which are both already at or near capacity, according to the most recent demographer’s projections presented to the board in May. Sonoran Foothills, which opened in fall 2015, is the most recently opened DVUSD school. “What’s happening in North Gateway is a lot of rezoning for residential,” said newly elected board member Julie Read, who also serves on the North Gateway Village Planning Committee. “State Trust land near Sonoran Foothills School was just auctioned off to Lennar Homes,” she said. 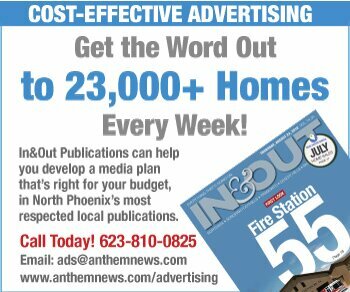 [See "Home Builder Buys 140 Acres of State Land in North Phoenix,” In&Out Magazine, Dec. 13, 2018.] She added there are lots of rezoning cases in progress for more single-family developments, townhomes and apartments. Board members Darcy Tweedy and Jenny Frank voted against the proposal. Tweedy said the district already has a problem of excess capacity. Tweedy also raised concerns of overbuilding schools in growth areas in the past that have aged out over time, and now those schools are under capacity. Anthem is one such area: Three of its four DVUSD elementary schools are below 80 percent capacity, with enrollment projected to continue declining in all four. In addition, DVUSD may soon have to address a space concern in the growing western portion of the district in Peoria (near Jomax Road and 75th Avenue). Migliorino said the district may call for another bond election to build an additional elementary school sometime in the next five years. Both Tweedy and Frank also suggested that nearby Desert Sage School could possibly handle the influx of additional students. USAA will take care of infrastructure and street improvements at the new school site. DVUSD will assist in getting the Alameda site rezoned residential. 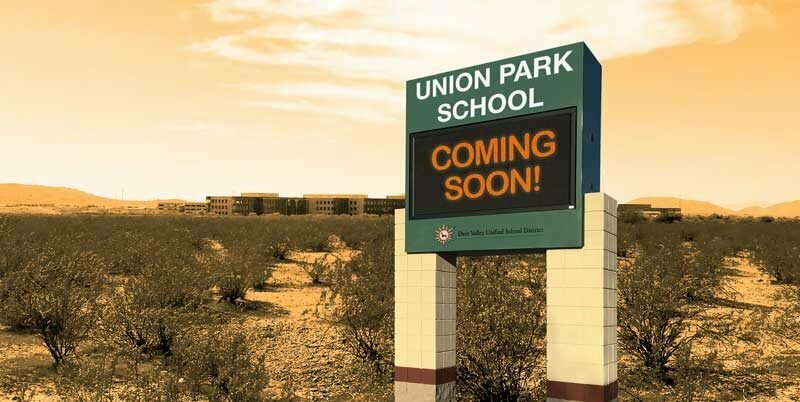 DVUSD agreed to begin the design phase of the project by the time 100 Union Park homes have sold and closed, and begin construction on the school by the time 200 homes have closed. Model homes were completed last month by three builders in the community, which at buildout will consist of 1,200 single-family houses and 800 multi-family homes. In the interim, students will attend the area’s designated schools, Esperanza Elementary and Deer Valley Middle School. Originally USAA had included a provision that students be bussed to Stetson Hills School, a higher performing school, but agreed to remove the clause during the months-long discussions with the district.